A Credit Report is essential to the hiring process in certain industries. Management of personal finances can be an important indicator of an applicant’s ability to prioritize and manage corporate responsibilities, especially finances, and are a must if an applicant will be handling cash. The Credit header will list the last three known addresses. Tax liens (reported for seven years after a lien is filed). Chapter 7 bankruptcies (reported for 10 years following the bankruptcy). Chapter 13 bankruptcies (reported for seven years following the bankruptcy). Collection items: (if they exist) and their status. A listing of accounts, in order from “worst to best” of creditors, allowing you to easily interpret the information. Up to seven years of public records are listed. You also will see a list of other companies making employment inquiries into the applicant’s credit file. Credit Reports require a name, address, Social Security Number, and a signed release form from the applicant. 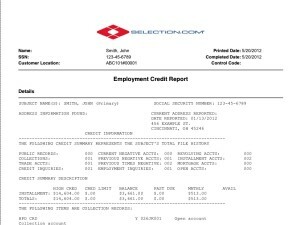 Click here for a pre-employment credit report sample background check. Click here for a full description of the pre-employment credit report.